The centerpiece of the cockpit, for gadget fans, are the two 12.3-inch display panels. One squarely in your line of view where your dials would go, and the other located right above the central stack. The line-of-sight display is where you’ll find your virtual dials of course, but there’s so much more going on. One of the most impressive features is the built-in 3D engine, that serves up images of adjacent cars, pedestrians and cyclists, even those obscured from view claims Acura, in real time. But why not just look out the window? Well the Precision Cockpit leverages a slew of onboard sensors and artificial intelligence to point out the projected path or paths of other road users, so you can get a heads up on if that cyclist coming from your right is about to cross your path. There’s not a lot of information on how accurate it is, or how it’s figuring it out, but if there’s a chance of it improving the safety of everyone, we’re all for it. 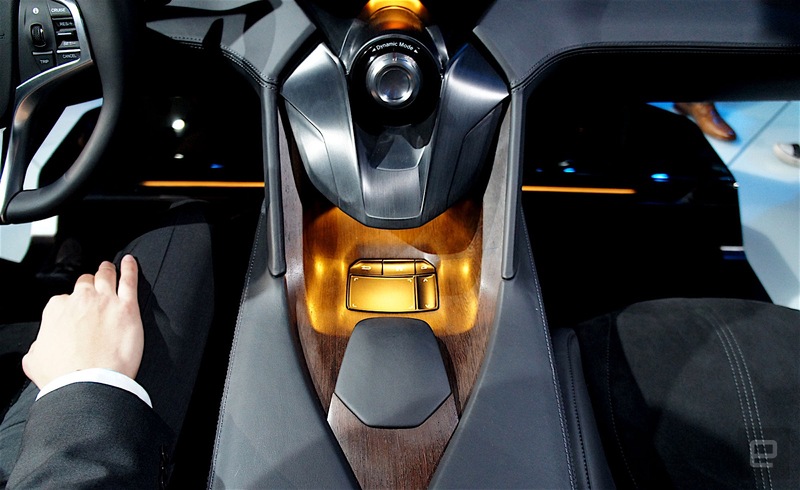 The central display is where you’ll find your more regular collection of infotainment options, similar to the panels you might find in other high end cars, such as the Mercedes S-Class (S65 etc.). That doesn’t mean there’s nothing new going on here, but Acura was most keen to talk about how you interact with it. This is where the “precision” in Precision Cockpit comes in. In the central stack, right where you might expect to find a physical remote or a jog dial like you get in most premium vehicles, you’ll find a curved touchpad — a bit like on a laptop. The curved design gives your digits some form of “center” without looking, and the actual touchpad is mapped pixel to pixel with the central display. And, as everything has to have a fancy name, Acura is calling this “absolute positioning.” But in short, it just means top right on the touchpad is top right on the screen. Which is mostly what you’d hope for anyway?